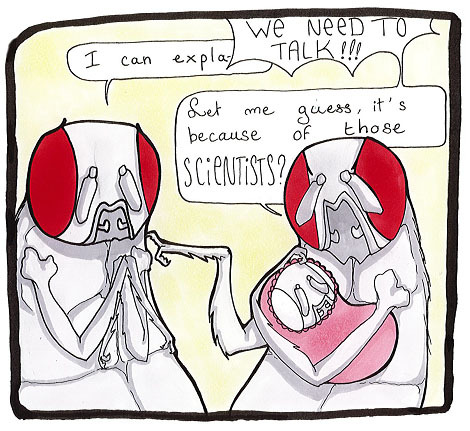 Giacomo Cavalli’s team at the Institute of Human Genetics (University of Montpellier / CNRS), in collaboration with the French National Institute for Agricultural Research (INRA),1 has demonstrated the existence of transgenerational epigenetic inheritance2 (TEI) among Drosophila fruit flies. By temporarily modifying the function of Polycomb Group (PcG) proteins—which play an essential role in development—the researchers obtained fruit fly lines having the same DNA sequence but different eye colors. An example of epigenetic inheritance, this color diversity reflects varying degrees of heritable, but reversible, gene repression by PcG proteins. It is observed in both transgenic and wild-type lines and can be modified by environmental conditions such as ambient temperature. The scientists’ work is published in Nature Genetics (Monday, April 24, 2017). Same DNA, different color. Researchers have obtained drosophila epilines—that is, genetically identical lineages with distinct epigenetic characteristics—with white, yellow, and red eyes respectively. They achieved this by transiently disturbing interactions between target genes and PcG proteins, which are complexes involved in the repression of several genes governing development. Cavalli and his team at the Institute of Human Genetics (University of Montpellier / CNRS) are the first to show that regulation of gene position can lead to transgenerational inheritance. DNA is not the only medium for communicating information necessary for cell function. Cell processes are also determined by the chemical labeling (or marks) and specific spatial organization of our genomes, which are epigenetic characteristics—that is, nongenetic but nonetheless inheritable traits. Epigenetic marks include modifications of histones, the proteins around which DNA is wound. PcG proteins, on the other hand, play a regulatory role by affecting 3D chromosomal configuration, which establishes certain interactions between genes in the cell nucleus. The position of a gene at any given moment determines whether it is active or repressed. Through temporary disruption of these interactions, the scientists were able to produce Drosophila epilines characterized by different levels of PcG-dependent gene repression or activation. They verified that these epilines were indeed isogenic, or genetically identical, by sequencing the genome of each. Despite their identical DNA, the integrity of epilines—and the unique phenotypic characteristics they program—can be maintained across generations. But this phenomenon is reversible. Crosses between drosophilas with over- or underexpressed genes and others having no such modifications to gene activity “reset” eye color without altering the DNA sequence, thus demonstrating the epigenetic nature of this inheritance. The researchers then showed that new environmental conditions, such as a different ambient temperature3, can affect the expression of epigenetic information over several generations, but they do not erase this information. Such transient effects of environmental factors to which earlier generations were exposed on the expression of characteristics in their progeny illustrate the unique, pliable nature of this epigenetic mechanism. By conducting “microcosm” experiments that recreated natural environmental conditions, the researchers—working with INRA—confirmed that epigenetic inheritance in Drosophila can be maintained in the wild. Giacomo Cavalli’s crew has therefore proven the existence of Polycomb-mediated stable transgenerational epigenetic inheritance dependent on 3D chromosomal structure. Their findings offer new horizons for biomedical science. They suggest that epigenetics could partly solve the mystery of “missing heritability”—that is, the absence of any apparent link between genetic makeup and certain normal hereditary traits and diseases. 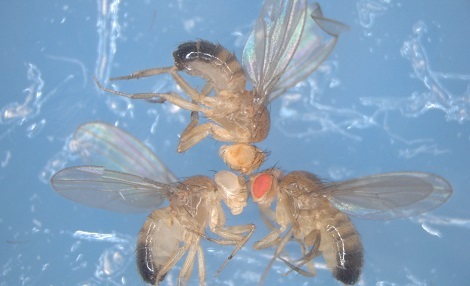 Three drosophila epilines are shown. All share the same DNA sequence, but each has a unique eye color caused by transient perturbation of their epigenetic state. This perturbation alters levels of Polycomb-mediated repression of the eye color gene. 1Researchers from the Centre de Biologie pour la Gestion des Populations in Montpellier and the Toulouse branch of the Division of Applied Mathematics and Informatics (MIAT). 2Epigenetics is the study of changes in genetic expression that do not involve modification of DNA sequences but may still be passed on through cellular division. Unlike mutations altering DNA sequences, epigenetic modifications are reversible. 3Like other insects, drosophilas cannot establish a constant internal temperature independent of environmental conditions. Ciabrelli F, Comoglio F, Fellous S, Bonev B, Ninova M, Szabo Q, Xuereb A, Klopp C, Aravin A, Paro R, Bantignies F, Cavalli G. Stable Polycomb-dependent transgenerational inheritance of chromatin states in Drosophila. Nat. Genet. 2017 Apr 24. doi:10.1038/ng.3848.